"Resort village" is a more than usually apt description of this immense property—so vast, in fact, that its 45 hectares embrace seven hotels and a combined total of 21 restaurants, not to mention a Thalassotherapy spa, nightclub, a mini-club for children 3-11, a church, soccer field, go-kart track, ice rink, too many swimming pools (fresh and saltwater) to mention, and a business school for those seeking a masters in hotel management. All of this and more can be found 45 kilometers from Cagliari on the southern tip of Sardinia, where a cerulean blue Mediterranean washes up against a broad, tree-lined beach. 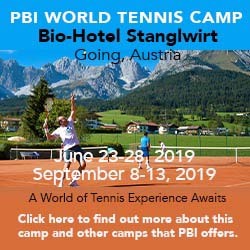 From May to September, a staff of pros offers lessons, clinics, and a weekly tournament on the resort's 7 red-clay, 2 hard, one natural grass, and one artificial grass—supplemented during the season by resident former touring pros, among them the likes of Pat Cash and Tomas Enqvist.